The Hong Kong Rangers Supporters Club are proud to announce that we have joined Rangers First with a “Club 1872” life membership. We would also strongly encourage all other fans to also join up at whatever level they can. Monthly subscriptions start from as little as £5 a month. 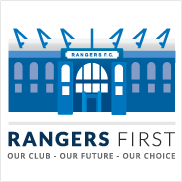 Rangers First if also available to overseas fans, so it is now the time to use our vast global fan base and start the ball rolling to get more say in what is going on at our club. It has been hugely encouraging to see the Rangers First membership grow substantially in the last few days alone with 140 new members yesterday alone edging the membership close to the 2,000 mark – so there is a very strong chance the membership in Rangers First will have doubled in the space of a week! Let’s keep the momentum going and help spread the word! So be sure to sign up and join an ever expanding group of like-minded fans who only want the best for our club. Both ORSA & the Perth RSC are already Rangers First Club 1872 life members! « Rangers v Queen of the South – 10pm tonight!